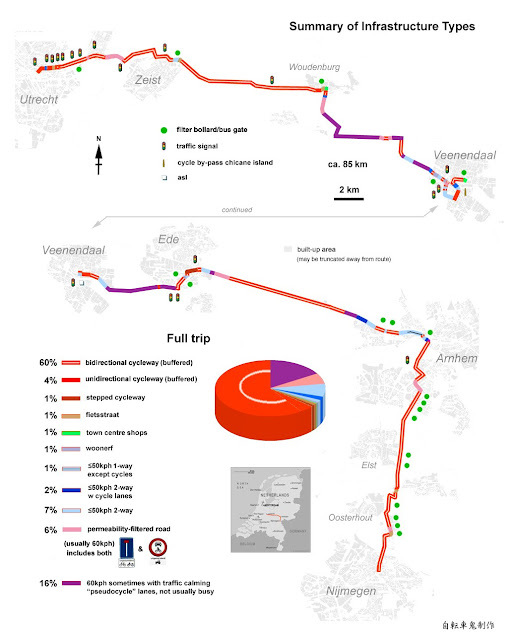 I cycled from Nijmegen to Utrecht in 2016 and so, almost exactly a year later, I decided to cycle in the opposite direction, from Utrecht to Nijmegen. 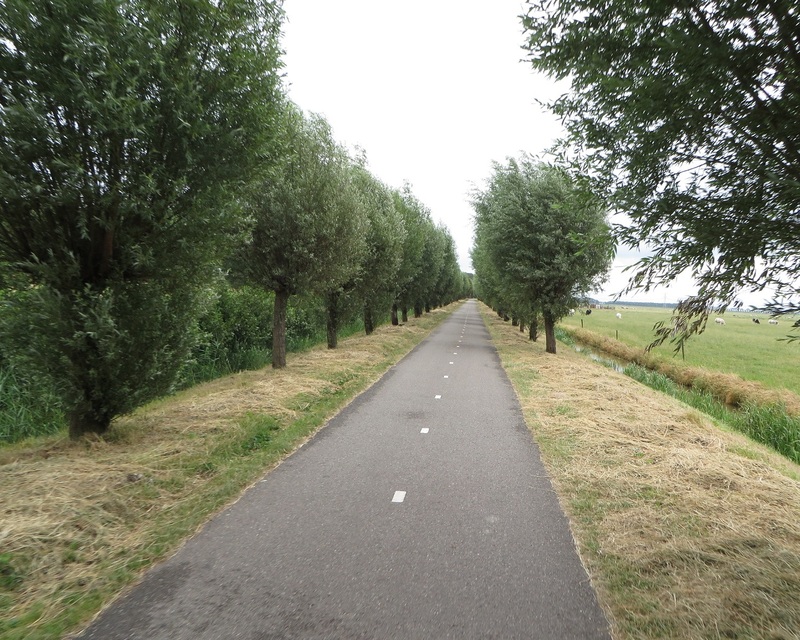 Obviously I wanted to take a different route and chose to go through Veenendaal, which I'd previously read about on Mark Treasures blog, and also use the fast cycle route from Arnhem to Nijmegen. This would be a long ride and so I scheduled it for Wednesday, knowing that I wouldn't have any other rides between cities left after this. Accommodation for these trips is booked months in advance and so the dates are fixed as to when I ride, which means I ride whatever the weather. Had I done this trip a week earlier, as I was originally planning to do, then I would have been cycling through very high temperatures as the Netherlands was experiencing a European wide heatwave. 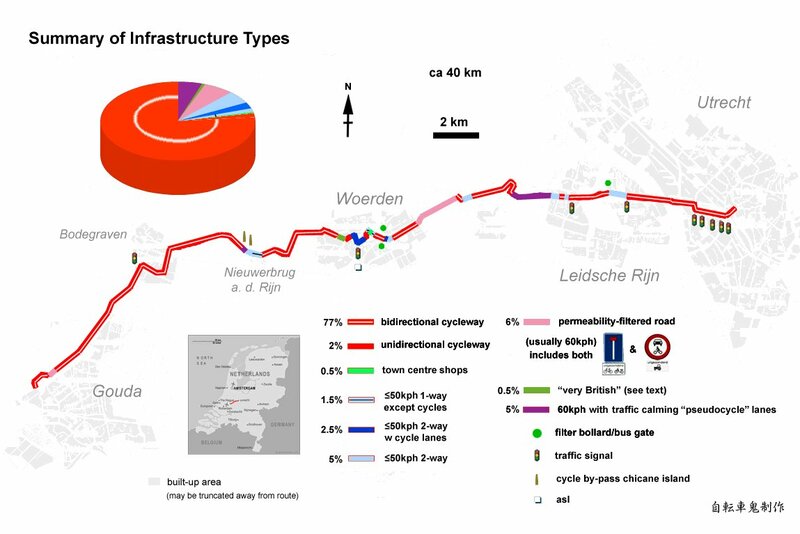 Every time I told anyone in Utrecht I was planning to cycle to Nijmegen the following day they responded that I would get caught up in thunderstorms. Thankfully after getting wet on the ride from Nijmegen last year I had come back equipped with waterproof overalls. I began my journey out of Utrecht along Voorstraat, a street I had already had a bad experience on during my time in the City. This time was no different as I and others had to pause whilst a bus drove on the cycleway. I continued along Biltstraat with light rain beginning, not heavy enough for me to get my waterproofs out but it was for others. 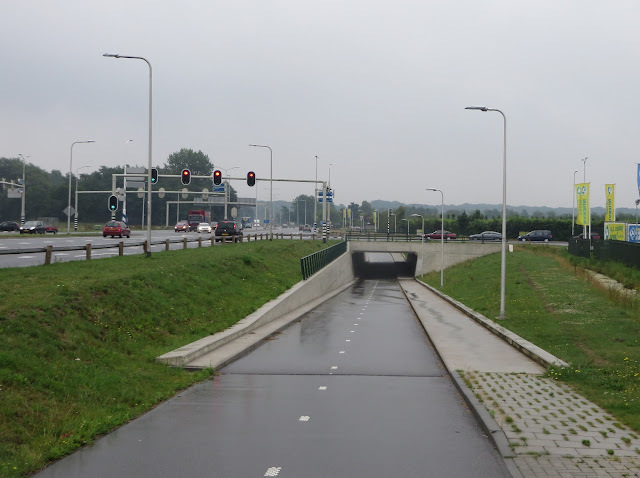 I cycled under the large roundabout where it met the ring road and came out on the other side of the road, as I exited Utrecht. I could also see from here there was another bidirectional cycle track on the opposite side of the road as well, and it was being well used, despite the rain and the frequent buses along here. The cycle track continued behind a petrol station, briefly becoming a service road for houses alongside afterwards, but then reverting back to a cycle track. 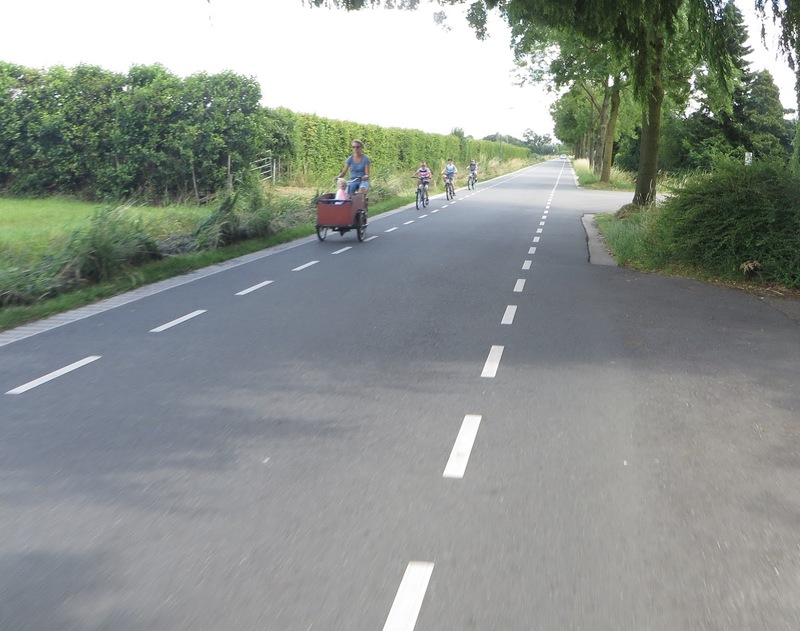 I passed by a bus stop, with ample bicycle parking spaces provided for local residents in this rural area cycling to the bus from their homes. I cycled through an underpass as I passed under the N412, and thanks to google maps I can travel back in time to see before this was built and cyclists had to wait at the lights to cross, rather than the much more convenient grade separation that exists today. The cycle track ended after here to become a service road alongside the main road, although I noticed that a cycle track continued on the opposite side of the carriageway. 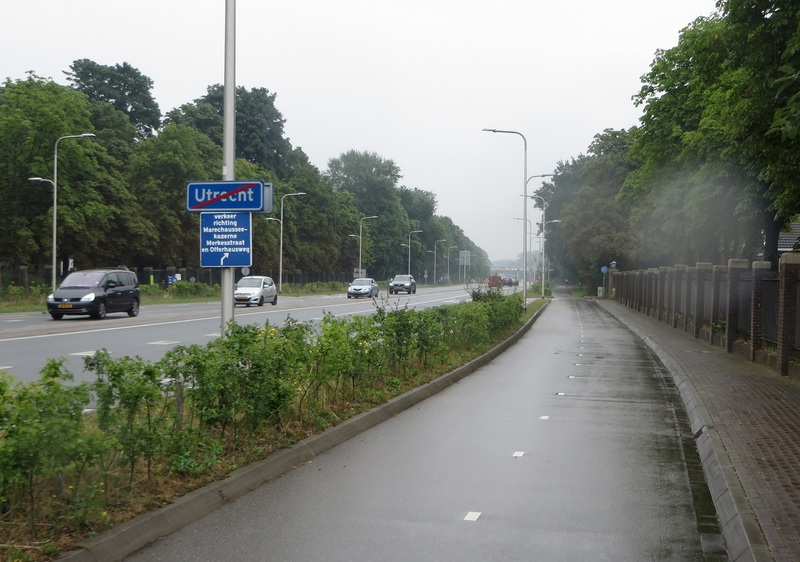 Whilst the road continued straight ahead to go into Zeist the N237 made a left turn here to bypass he town, as did I. I continued along a bidirectional cycle track alongside the road, with light rain continuing but not heavy enough for me to get my waterproofs out of my bag. 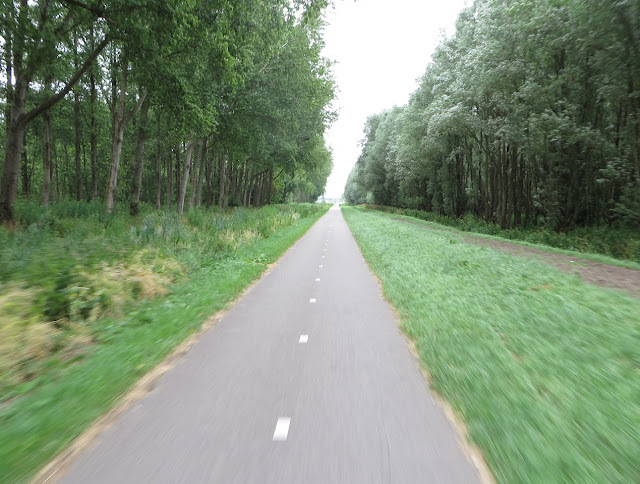 I took the first right, bypassing the traffic lights, to cycle along Panweg towards Zeist. As I passed over the A27 motorway I couldn't help be impressed by the gigantic sound barrier that existed here and stretched well into the distance to protect the residents of this town from the noise of the motorway. 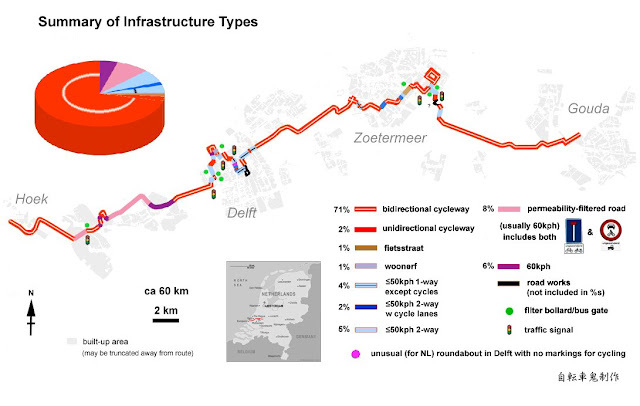 As I entered Zeist I came to a roundabout with a bidirectional cycle track running around it. I was to turn left here and did so by going the "correct way" around 75% of it, rather than just turning left - I still can't quite get used to going the "wrong way" around a roundabout! A used a bidirectional cycle track alongside the road for a short while before I turned right where it lead me onto a minor road. At the end this joined up with a cycle track running along the N224, which cars could use for a short while to access a couple of properties before a barrier stopped them going any further. This route would continue for the next ten kilometres, a very pleasant route with a smooth, well maintained cycle track with a busy road on one side and forest on the other. The rain soon stopped and I thought about how lucky I was that I had managed to escape the promised thunderstorms, in the end it was just a light shower from Utrecht to here that simply kept me cool and didn't get me too wet. As I arrived on the edge of the town of Woudenberg, my planned route was to continue south along the N224 but I decided to head into the town to have a quick look instead. 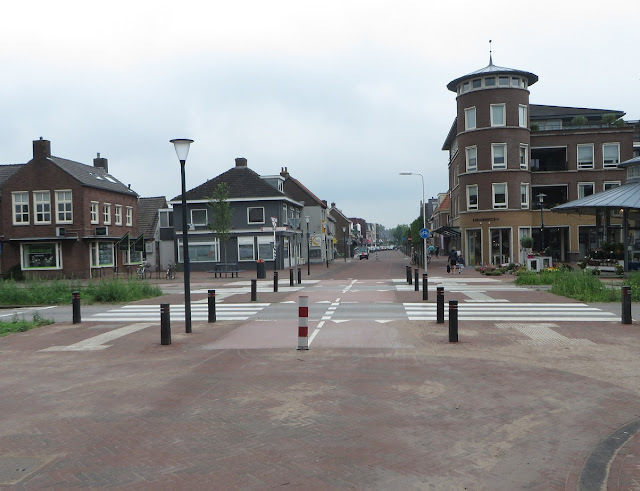 For the first time in the Netherlands I used British style "staggered" crossings with barriers, but for bikes, rather than for pedestrians. 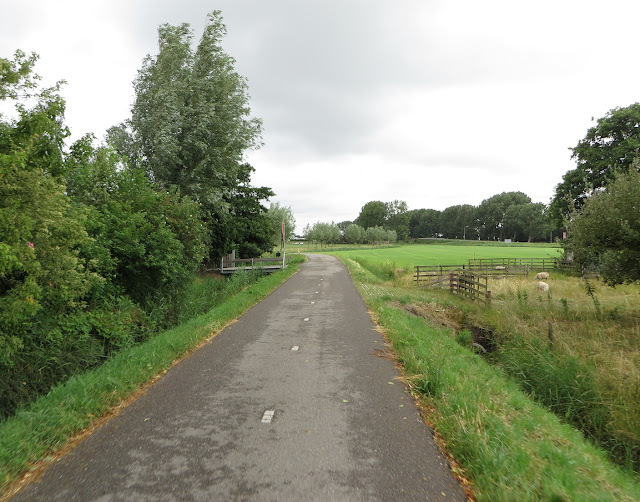 I was now on the most direct road running through the middle of Woudenberg, and what presumably would have been the main road for many years, before the N224 was built to bypass the town to the South. 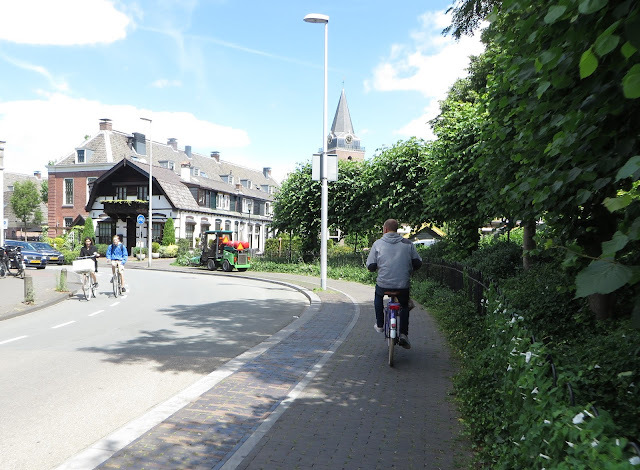 The first section of this road had wide cycle tracks alongside both sides and then a "fietsstraat" sign to indicate cars were guests as I reached the centre of the town, with a traffic calming layout. As I came to the centre of the town and the junction with the N226, the main route north / south of the town, only people cycling or walking could continue across it. I turned right here on to a tiled cycle track, which then became a service road and crossed over the road onto another service road which took me out of the town. Turning left I used a series of country lanes to serve a small amount of houses and farms, before it became a cycle track which ran alongside the railway and then joining up with another country lane. At the end of this road I came to a T junction and turned right onto another country lane but with a narrow bidirectional cycle track running alongside it. I stopped for a spot of lunch at a bench alongside here, right next to where the A12 motorway passed ahead and as I sat there I was impressed by how many teenagers were out cycling along this road, a constant stream of small groups of them, presumably heading to or from college in Veenendaal, which was still a few miles away. 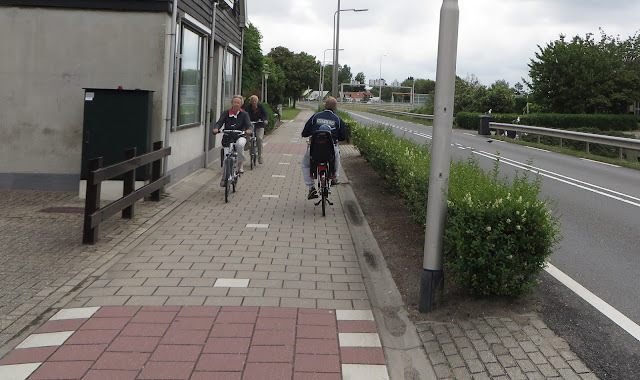 After I had finished my food I set off again behind three teenage boys cycling ahead of me, we all turned left after a short while to cycle along a road, turning right onto another road and then left onto a cycle track. 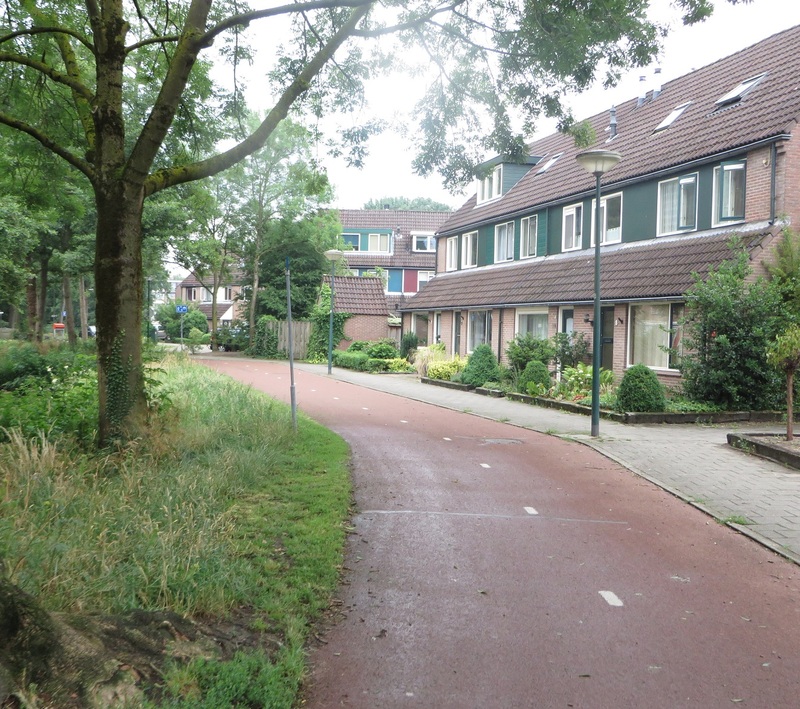 I was now on the outskirts of Veenendaal and the route took me through residential areas on quiet residential streets that were not through routes for motor vehicles but were for people on bike or foot, and also along cycle tracks, direct and separate from the road network. Barely anyone was cycling but barely anyone was walking either, as we all huddled under the canopy by the entrance to the shopping centre to escape the torrential downpour. After around 20 minutes the rain eased slightly (but it was still raining hard) and I put my waterproofs on and set off again down the main shopping street. As it was raining so hard I didn't take my camera out too much for the rest of the journey. I turned left at a terrible junction with ASL and a cycle lane in the middle. 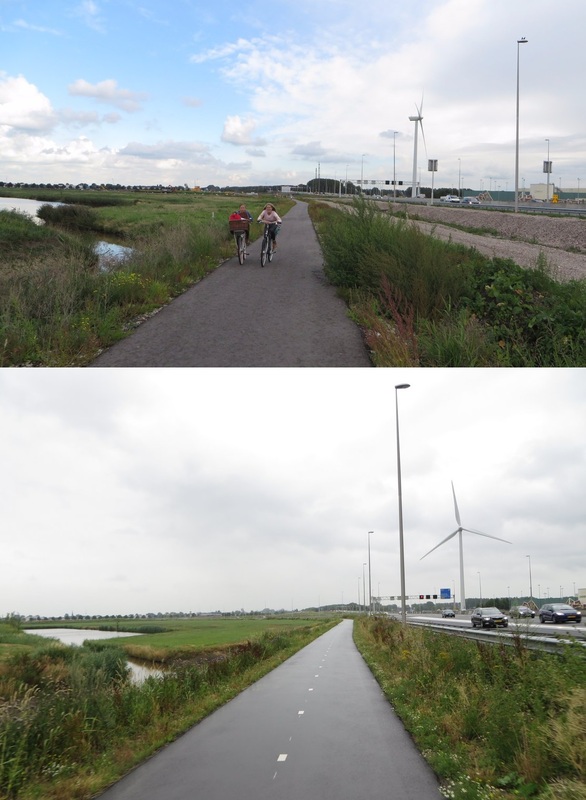 I cycled along a tiled cycle track, which then became a smooth bidirectional cycle track before it peeled away from the main road and turned south. It then became a road leading to some residential properties and then turned left, as I exited Veenendaal. I headed east along some country lanes, a pretty unpleasant ride but more to do with the constant rain. 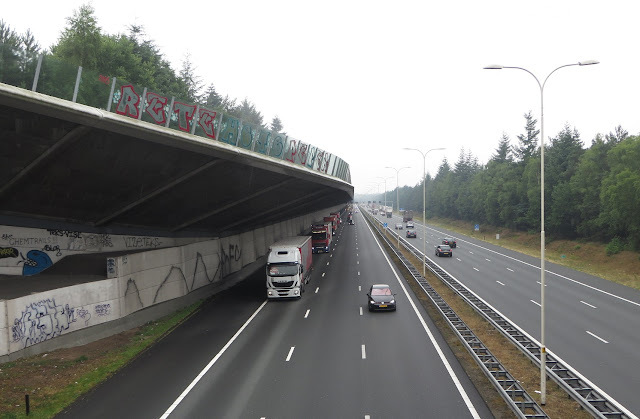 I then reached the outskirts of Ede and took shelter under a bridge at a large motorway intersection. Whilst my waterproofs were keeping most of me dry my trainers, socks and feet were soaked through and I just needed a rest from the constants rain pounding my face. After a while I carried on and cycled over the A12 motorway on a cycling bridge alongside the N781. 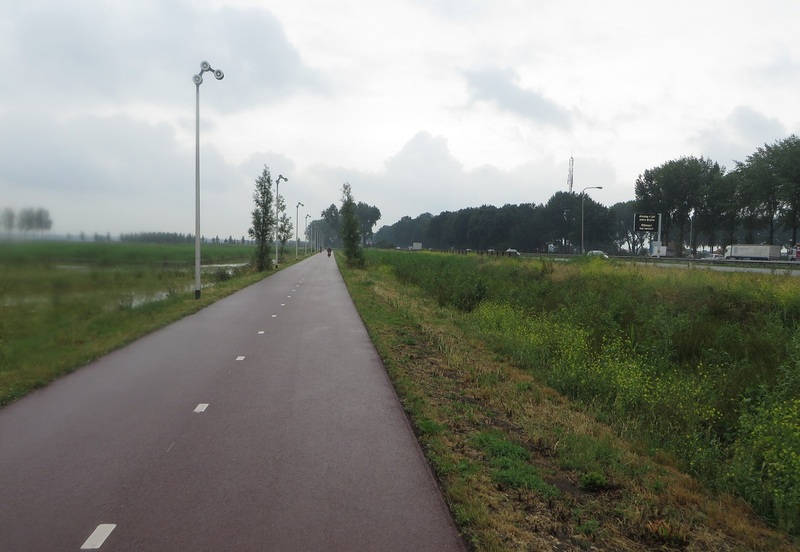 The original plan was to spend an hour or so exploring Ede but as the rain was heavy and the streets were so empty it seemed best just to push on towards Nijmegen. I cycled through Ede on a combination of cycle streets and cycle tracks and a fairly long section on a stepped cycle track, which is a rare sight in the Netherlands, just a shame it was too wet to get any decent pictures of it! I passed by De Fietser, a gigantic bicycle warehouse showroom where you can go to try and buy all sorts of bikes. I had intended to go in and have a look but due to the weather I'll have to make do with looking at the inside of it on streetview instead. 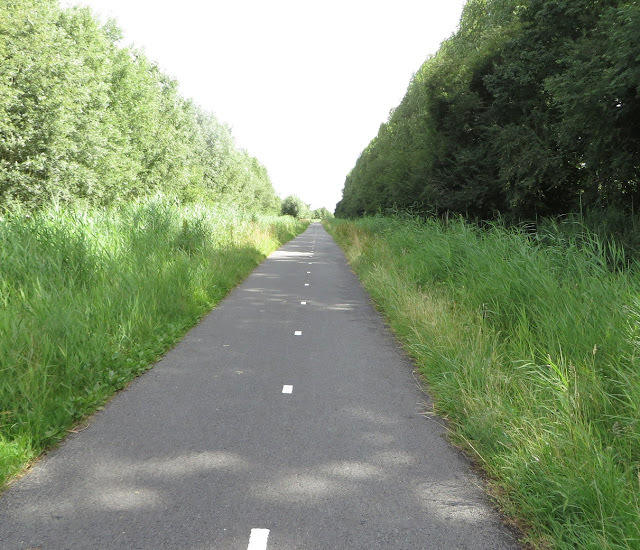 I cycled alongside the railway out of Ede and then onto a path through the forests. Now, this was an excellent route and would have been a fun ride but at this point it once again started to pour down with torrential rain, so I couldn't enjoy it as much as I should have done. The route continued like this for the next ten kilometres, a really pleasant route through the forests but the rain was constant here so I didn't enjoy my surroundings as much as I'd have liked to. 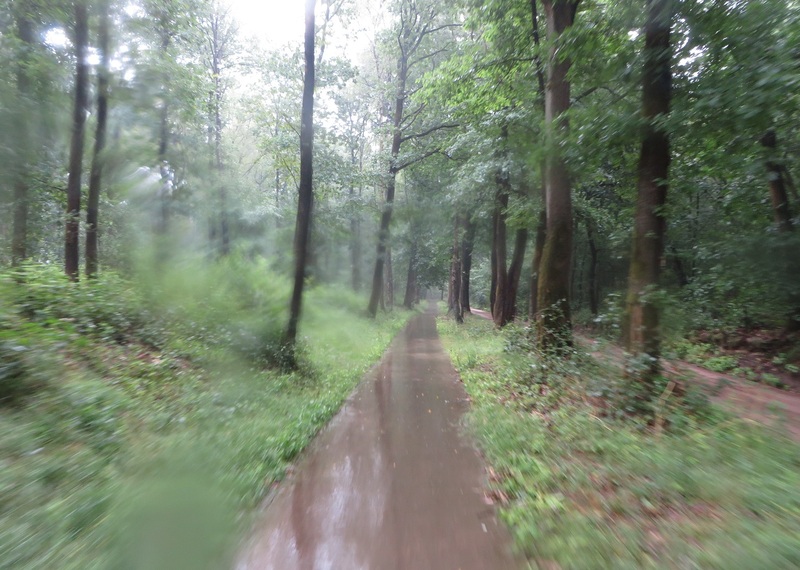 The path was puddle free though, despite the terrible conditions and so cycling through the forest was pleasant and not like your typical British National cycle route! 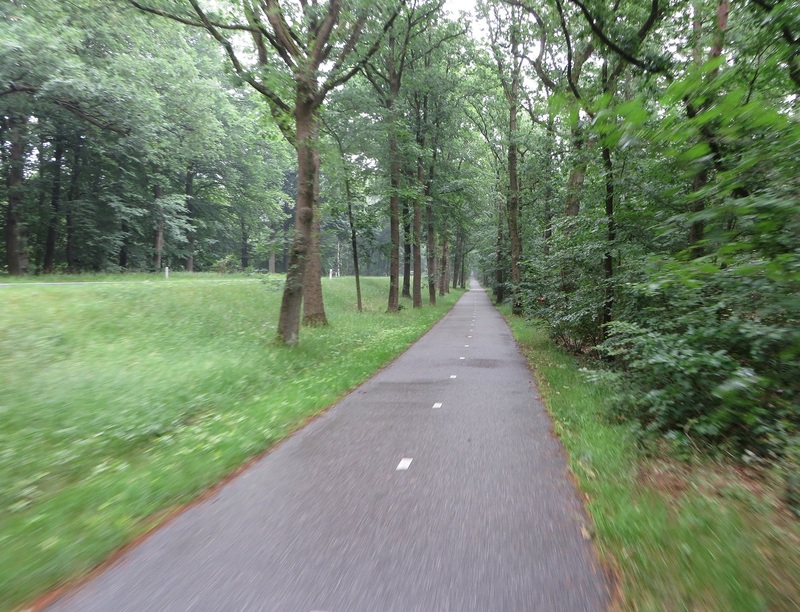 As I approached the town of Oosterbeek the cycle track went onto a road, but so wet was it I couldn't even risk getting my camera out so here is a streetview link of the location instead. 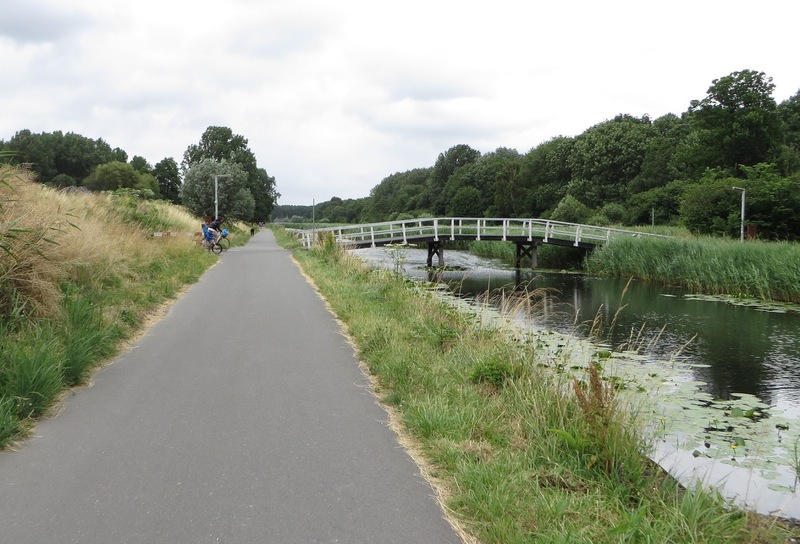 I soon arrived in Arnhem, where there was little appetite from me to explore the city in this weather, and so I crossed over the railway tracks and soon found my way onto the fast cycle route to Nijmegen. Once out of Arnhem the rain thankfully stopped and I was able to enjoy the ride again, although with a very wet bike and feet! I soon arrived in Nijmegen and was happy to have both ended my ride and also to be be back in this great city, which is always a pleasure to cycle through. I crossed over a road, where the school / college run was still taking place and then continued alongside the motorway, safely separated from the lorries using it. This route would proceed along the A12 for the next few miles, with a few other people using it to get about their daily business, dressed in their daily getting about kind of clothes. As I approached the town of Bodegraven the cycle track gradually moved closer to the N459 road and as I briefly stopped to take pictures of a house on the outskirts of the town with an array of decorations, a man dressed in lycra on a road bike looked towards where I was taking pictures and stopped to whip out his mobile to take a few snaps as well. 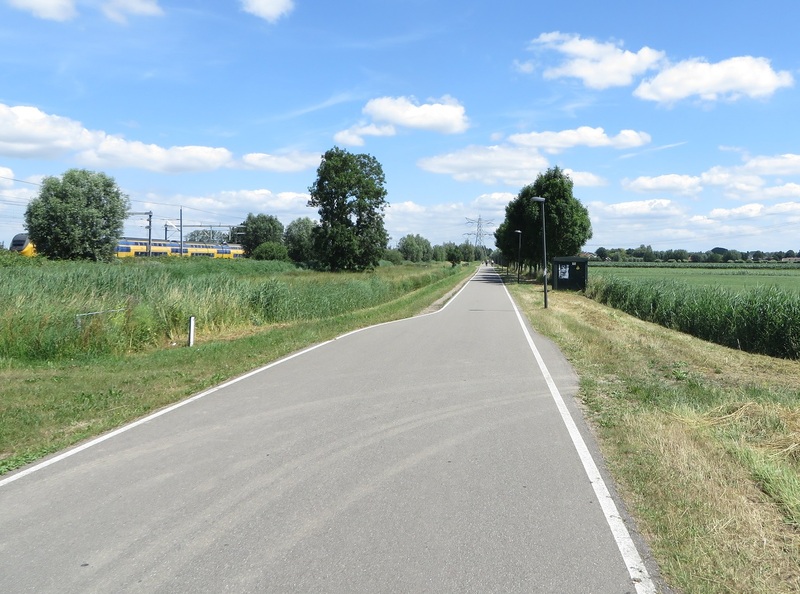 The bidirectional cycle track continued into the town and I then turned right onto another bidirectional cycle track alongside a road heading east through an industrial area in the southern part of the town. There were a lot of lorries using this road, so I was glad to be separated from them. As the road turned north along the edge of the residential part of the town I couldn't help notice that you could access several residential roads from here by bike but not by car. Direct routes for those on bike or on foot, whilst those driving have to go the long way round. 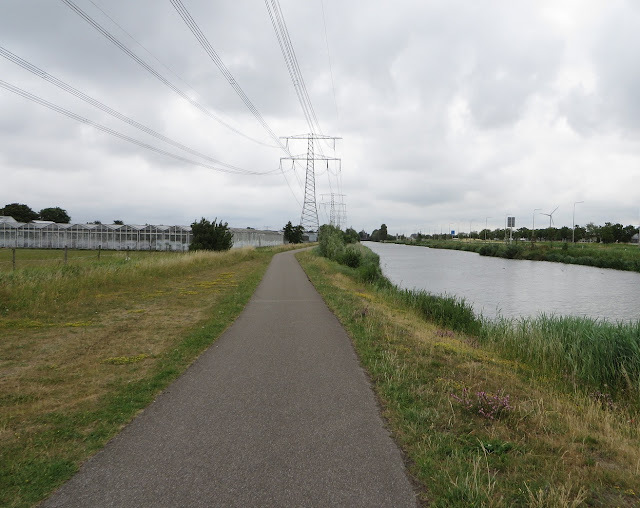 I passed under the railway line and then turned right as I approached the Oude Rijn river to cycle along a narrow path along it. This route would continue for around the next five miles, nestled between the houses and the river, a very nice and relaxing ride. 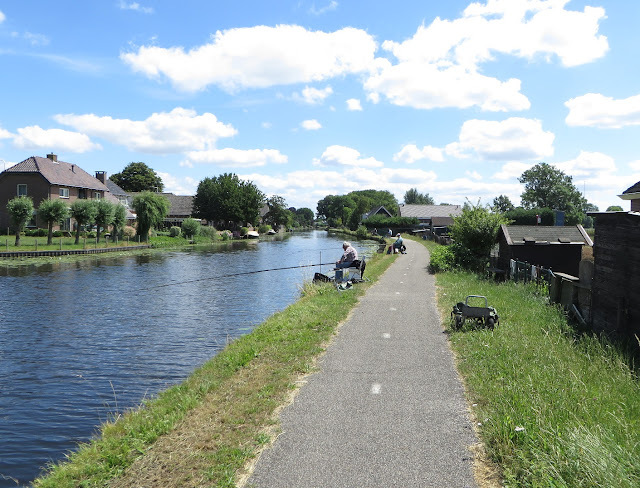 After briefly stopping at a bench to eat a sandwich I continued on to the village of Nieuwerbrug, where the riverside path was restricted to pedestrians only and so I joined the road through the village before rejoining the path, which was being used by more people fishing than it was cycling. 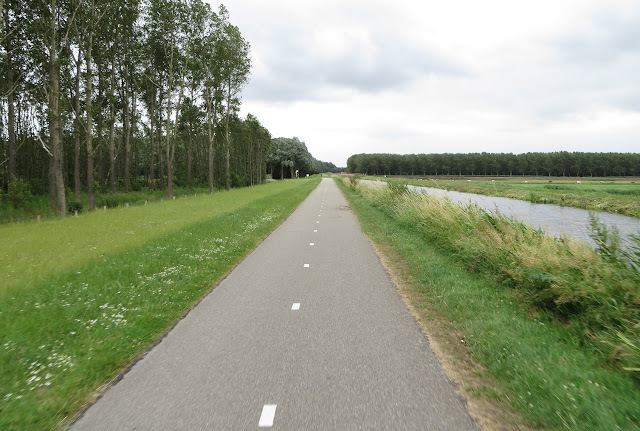 As I approached Woerden I once again left the path to join the road, a road which had no cycling infrastructure on it and it felt very British, before I turned left to where a tiled cycle track was available. 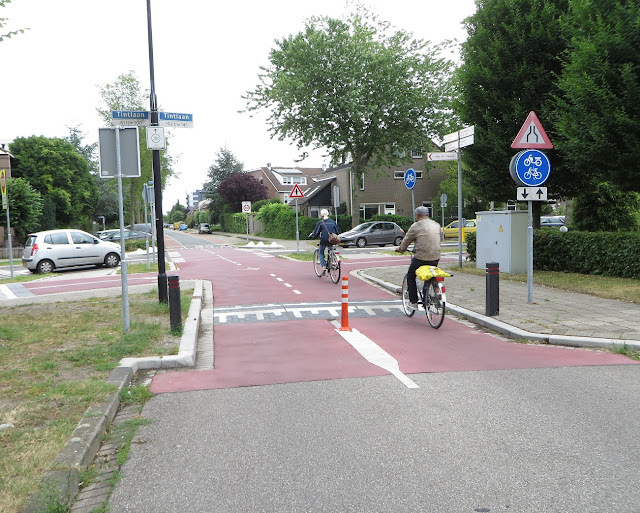 I turned right, onto painted cycle lanes and cycled behind a teenager carrying some long piping, before turning left to use one of the few crossings of the circular moat/canal to get into the very centre of the city. I could have bypassed the centre altogether of course but thought it was worth a look whilst I was in the area. Once in the centre I cycled around a section of the inner ring road, which was one way (anticlockwise) for motor traffic but two way for cycling. A bit of an odd arrangement and I didn't think much of the painted cycle lane for those cycling anticlockwise, who had to share the road with buses. 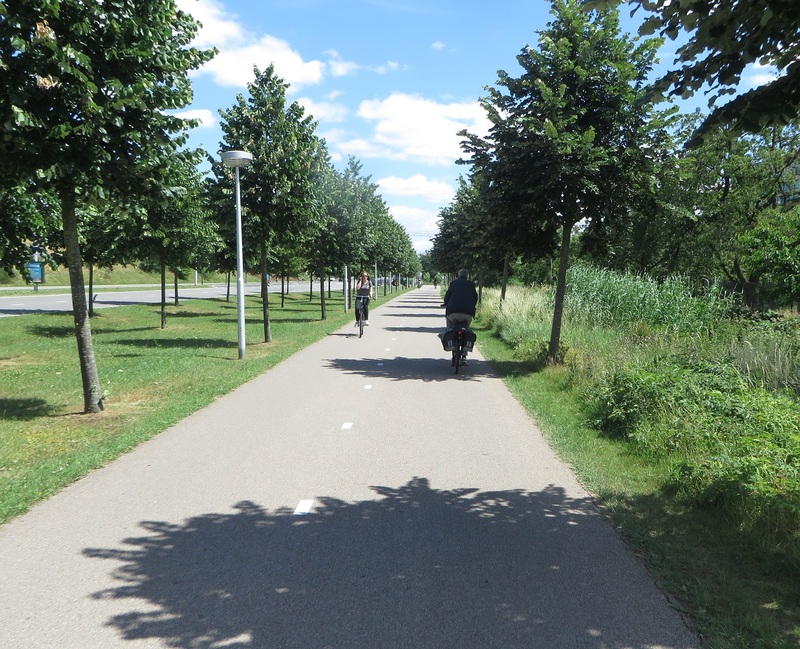 I then cycled south down Rijnstraat, a shopping street accessible by people walking and cycling only. I then used a small section of the inner ring road again to access a walking and cycling only bridge over the moat and out of the centre. 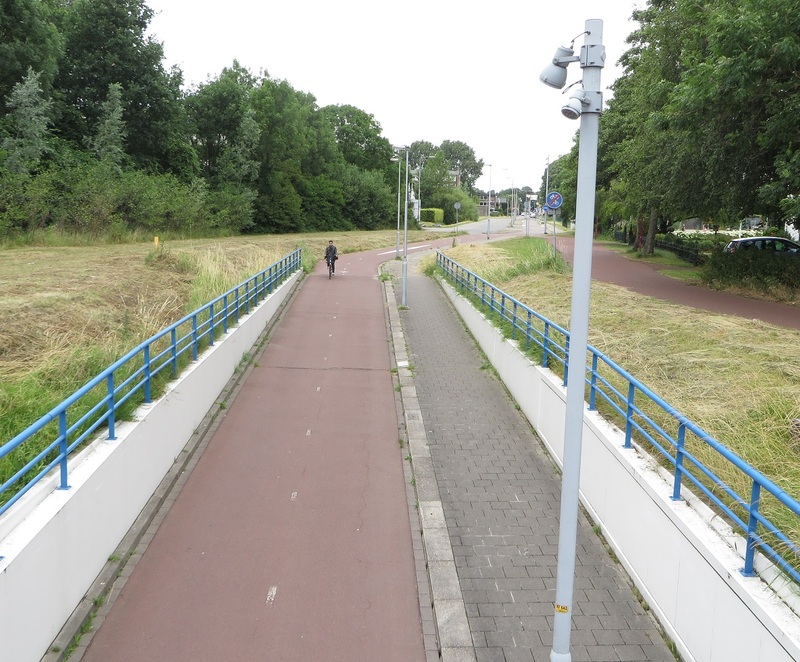 The cycle track directly passed outside the railway station before looping under itself and leading me to a bidirectional cycle track alongside one of the main roads East out of the city. There were a couple of secondary schools located alongside this road and so naturally there were students cycling along the cycle track all the way out into the countryside. As the road turned north the cycle track turned into a narrow access only lane and continued alongside the railway line. I then turned left to cycle over the filtered lane that I had just used. From here I cycled on a road for a short while before being directed onto a narrow, unmarked bidirectional cycle track on the other side of the road. It soon switched to the other side of the road and became a marked, tiled cycle track. Crossing over the next T-junction I turned right onto a bidirectional cycle track, which narrowed before a left turn onto a road with painted lanes at each side, although this was being used by a family of cyclists. 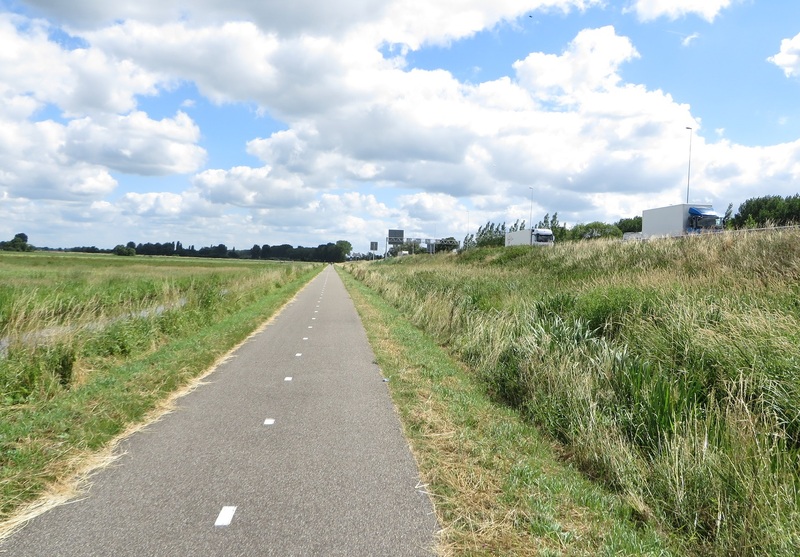 The countryside suddenly gave way to housing as I reached the outskirts of Utrecht and after navigating a large roundabout I used a cycle track which became a service road. I then crossed over the road onto a wide cycle track which ran between the main road and the housing alongside. As the main road elevated over a road, the cycle track stayed at ground level, giving way to the next road along but then climbing back up to run alongside the main road again. I turned left at a cycle crossroads and passed under the road and railway line to cycle alongside Utrecht Terwijde railway station, although I'm not sure why I did this as to continue directly along the lovely wide cycle track would have been the most direct and more pleasant route. I soon turned right to go back under the railway line and road and then left to rejoin the cycle track. As the track lifted up past Utrecht Leidsche Rijn Railway station I looked to my right to see construction of this new neighbourhood underway, completely unaware that I was also passing over the A2 motorway, which had been buried underground in this spot between 2007 and 2012 to make way for this new development. As I looked down at the building work I could see people cycling through the construction sites; clearly they had built the cycling routes long before they had built the shops and houses that will one day be here. I passed over the canal and a long descent down from the bridge, past a wide, main road that will soon cease to exist and into the centre of Utrecht. For the third summer in a row I arrived into Hook of Holland, via an overnight ferry from Harwich, to spend a week cycling around the Netherlands. My previous two visits to the country had started by cycling into the small town to buy some breakfast from a local bakery, however this time I gave into the constant PA announcements and ate a buffet breakfast on the ferry itself. It wasn't a particularly satisfying meal and was considerably more expensive, therefore I expect to return to buying my breakfast from one of the local bakeries on my next trip to the country. 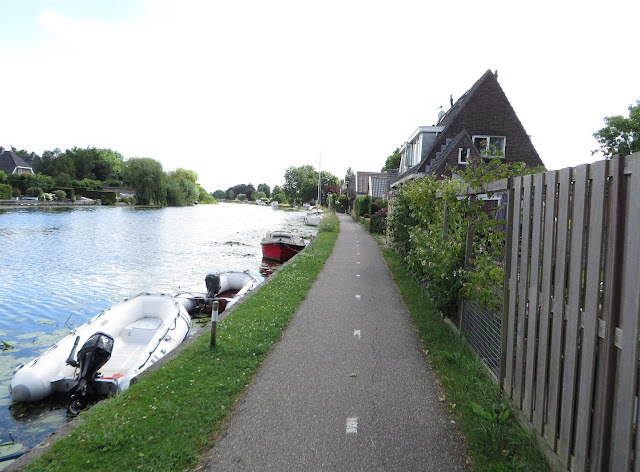 However, choosing to eat on the ferry meant that as well as skipping a visit into the town I could use a cycle track for the first time; one which runs directly from the ferry terminal to the N223, alongside the railway line. To get to it I crossed what used to be the railway line but had been completely ripped up to be transformed into a metro line. The cycle track here is not particularly wide or even that well maintained, with some obvious temporary carriageway repairs, but as it is just a short route to and from the ferry port it isprobably only going to be used by tourists like me a couple of times a day. 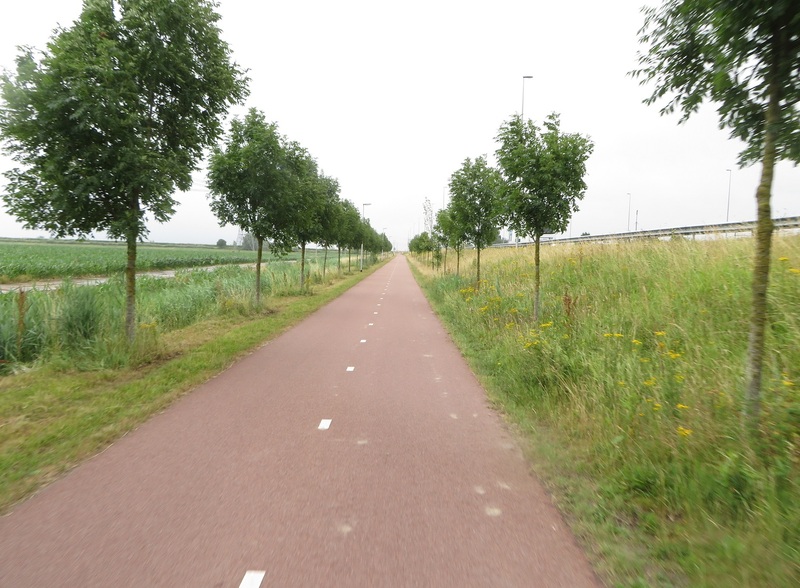 Still, it is nice to be able to use a cycle track almost as soon as you pass through passport control! this was being used by people rollerblading, cycling and walking. I cycled underneath the N223 and then alongside it for the next mile and a half, safely separated from lorries alongside, before crossing over the A4 motorway into Delft. 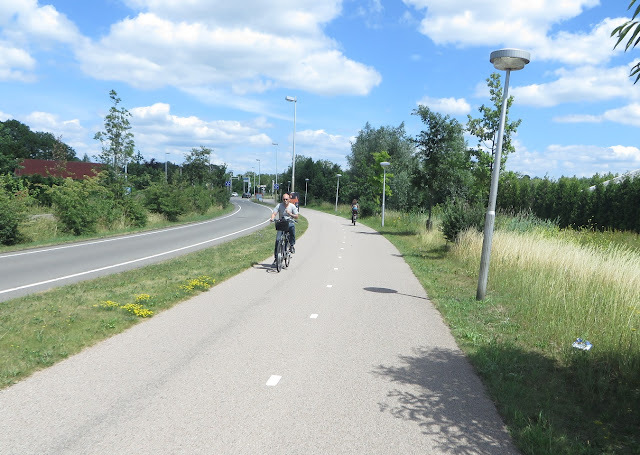 From this point the quickest and shortest way to get to Gouda would have been to continue along this cycle track alongside the motorway, which would have taken me directly into Gouda. However to my north lay Oosterheem, a new residential area of Zoetermeer and having been impressed by the cycling provisions of the new residential developments in Delft earlier in the day I felt it would only be sensible to detour at this point to go and take a look. I turned north and headed through a residential area and onto a bicycle road, the closure of the route to motor traffic under the road bridge making this safe for parents to cycle with their children, rather than the cycle marking "quietway" nonsense you get in London. I briefly stopped off at McDonalds, something I never do at home but the free wifi and decent toilets make this an attractive stop for coffee when I'm on long cycle journeys in the Netherlands. The cycle parking was well used and as many people seemed to be coming and going by bike as they were by car. Oosterheem was as great to cycle around as I was expecting it to be. A network of cycle routes separated from the road network crossing each other, with several cycling and walking only bridges, far more than existed for people in cars. These all linked up with each other, leading directly to residential properties and local amenities such as shops and the railway station, with ample bicycle parking. The main school and nursery alongside had a wide continuous cycle track right past it, whereas the road was access only for motor vehicles and could not be used as a through route. Meanwhile back in the UK and Sadiq Khan plans to tear down cycling and walking only routes in the Olympic Park to create new roads for motor traffic right past schools and homes! 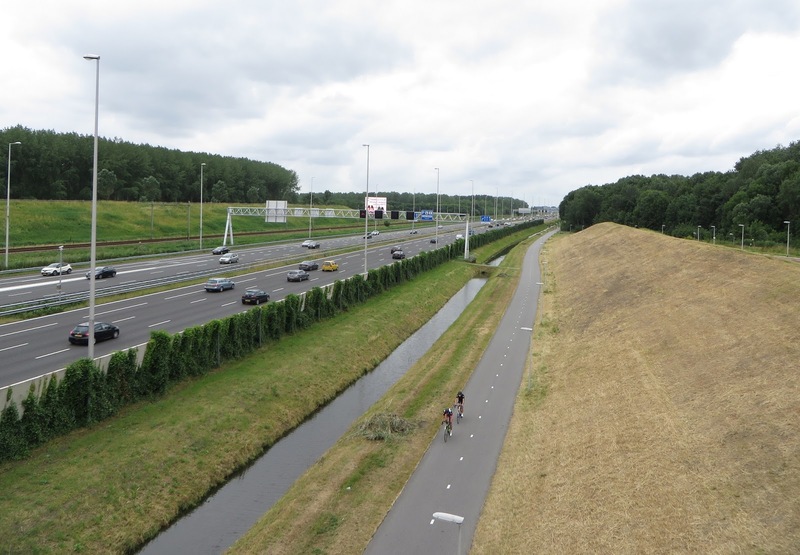 It began to lightly rain as I headed out of Zoetermeer towards the A12 motorway and then alongside it. 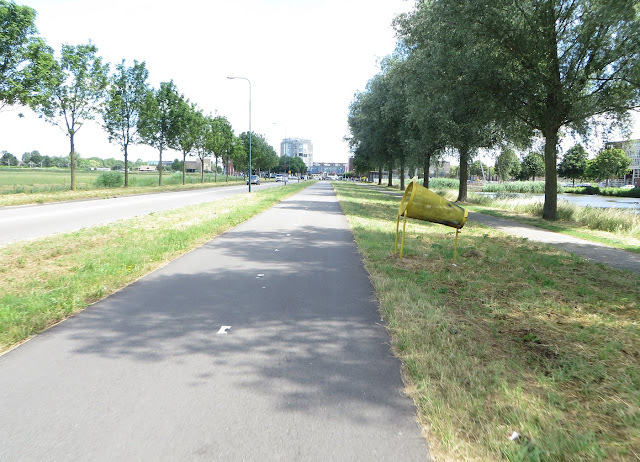 Turns out that these roadworks I had seen back in 2015 were the beginnings of a brand new road, now completed, which lead me through unfamiliar territory before seamlessly joining up with a more familiar route which took me into the centre of Gouda.